Draw Me a Story: A Century of Children’s Book Illustration San Francisco Public Library, Skylight Gallery, through December 2nd 2012. Like most kids I had a loving mother who read me to sleep with bedtime stories. 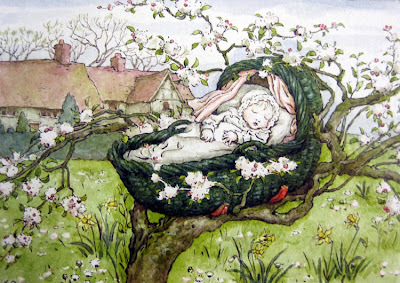 But not Beatrix Potter, which she didn't have time for. 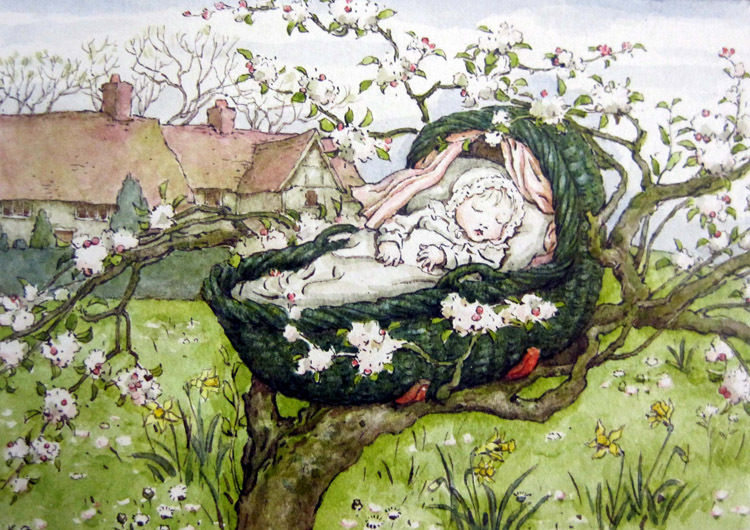 "Hush-a-Bye, Baby" from The April Baby's Book of Tunes by Kate Greenaway, 1900. Watercolor on paper. 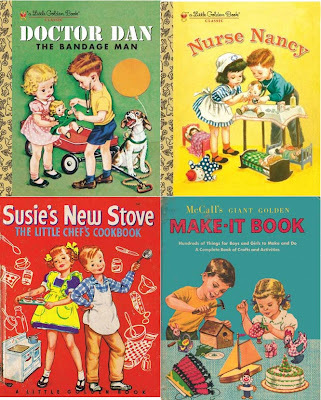 Malcolm Whyte, director of the Cartoon Art Museum in San Francisco, collects children's books, more specifically their illustrations. This autumn, San Francisco Public Library is showing selections from 41 artists in his collection that neatly document the story of children's books for over a century. The show has been touring, and was previously seen at the Frick in New York. There is no Beatrix Potter! 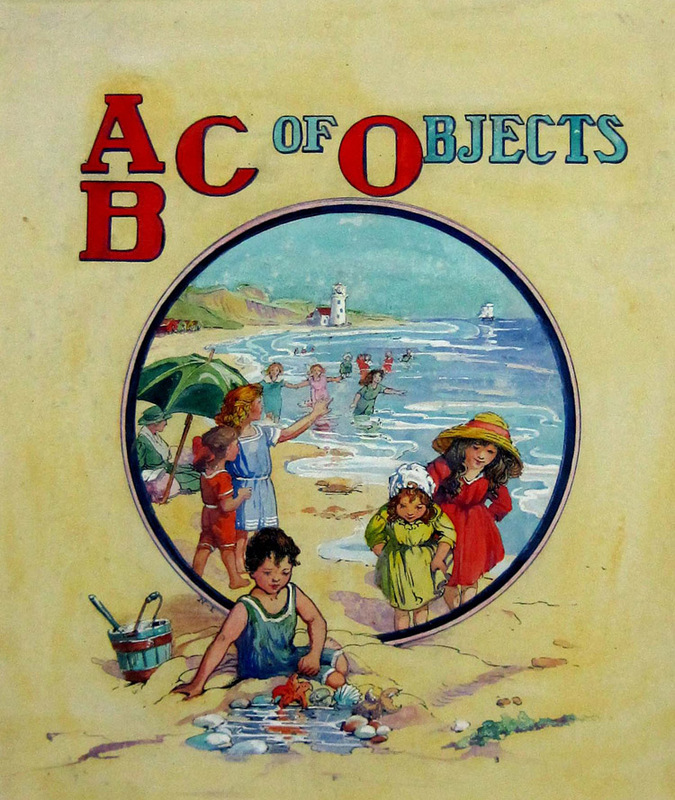 But we do see more important artists in the history of British printing and illustration: Randolph Caldecott and Kate Greenaway. Greenaway's father was an engraver so she understood how to prepare art for process engraving. The big names of the twentieth century, W. W. Denslow (The Wizard of Oz), Jules Feiffer (The Phantom Tollbooth), Chris Van Allsburg (The Polar Express), and Maurice Sendak (Where the Wild Things Are) are represented with original work. Beyond them, I only recognized one or two names — Edward Ardizzone and Palmer Cox — but there are many books to wonder at. Jack Kent fits naturally into Whyte's collection because he started out as a comic strip artist, drawing "King Aroo" from 1950 to 1965. But when his strip was cancelled, Kent moved to children's book illustration, producing over 40 titles, including Mr Elephant's Birthday Party (1969), Clotilda (1969), The Fat Cat (1970), and The Blah (1970). Sarah Noble Ives (1864–1944), "At the Seaside" from ABC of Objects, 1930s. Watercolor on paper. 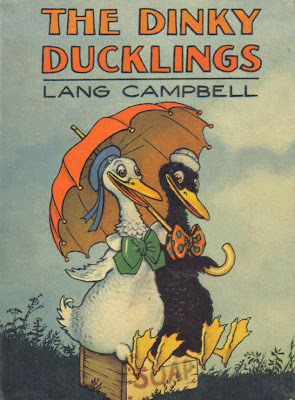 Lansing "Lang" Campbell is another comic strip artist who turned his hand to book illustration. He created "Uncle Wiggly," who ran in the Newark News from 1910. 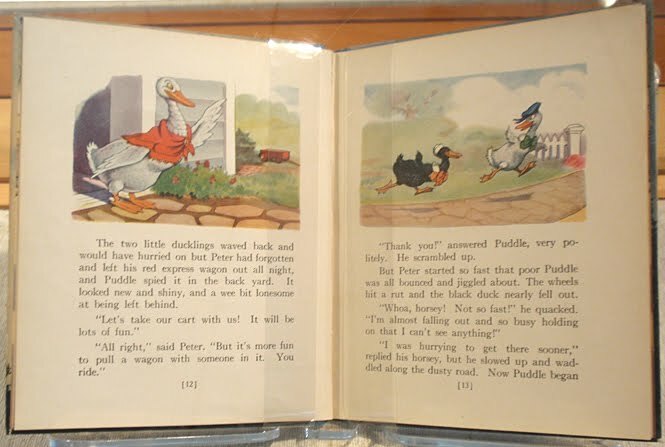 His children's books still have the feel of the layout of comic strips, and Peter and Puddle Duckdash, from The Dinky Ducklings, 1928, exemplifies this. His flattened perspective and line quality are similar to the animated cartoons of the time. Corinne Malvern (1901–56)'s work is well-known from her covers for the Little Golden Books which established a definite "Fifties Look." Malvern achieved much in her 55 years. She came from a Vaudeville family and began her career, aged 6, in the American premier of Madama Butterfly by Puccini. At 14 she made her first film, The Luring Lights. After being injured in a railroad accident during a tour she went to boarding school and then studied at the Art Students League of New York. From 1938 on she and her sister published 32 children's books with McLoughlin Brothers. In the forties she was Art Editor for the Ladies Home Journal. 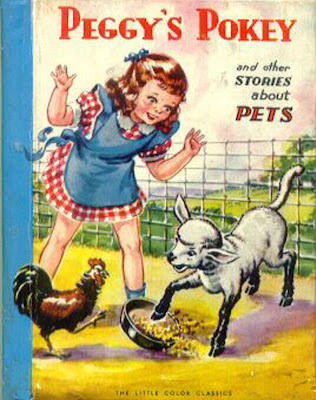 The artwork for Peggy's Pokey and Other Stories about Pets (1940) shows her technique: she would start with a pencil drawing then add layers of watercolor and fill in with gouache where she wanted a more opaque finish. 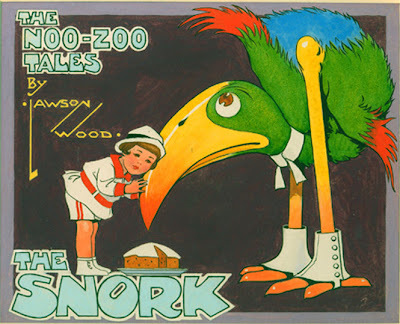 Lawson Wood's cover image of the Snork is charming. The Noo-Zoo Tales (London: Warne & Co., ca. 1922) shows the Snork, a giant bird in spats, who joins the circus and realizes he fits into society all right. There's a strength of line in Wood that recalls Winsor McKay of Little Nemo fame. In 1934 Wood was made a Fellow of the Royal Zoological Society; he also maintained a retirement home for elderly animals. L. Leslie Brooke (1862–1940), another Warne artist, would pull faces in the mirror to get the right expressions for the animals in his story books. 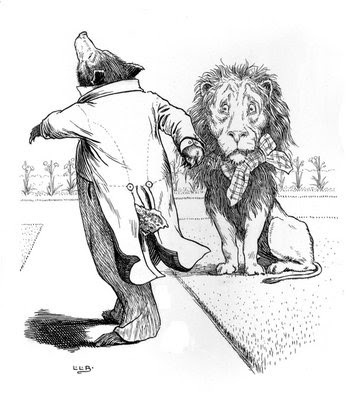 His original drawing for "Lion and Bear" from Johnny Crow's Garden, 1903, shows a lion in a bow tie and a bear in a dinner jacket, made to measure by monkey tailors. He continued the tradition of British cartoonists who illustrated Punch with humanoid animals depicting the world's nations (Britain was the lion and Russia the bear), though nationalism doesn't enter into his children's stories. The exhibit, on display through December 2nd, is a rewarding tour of a delightful aspect of book history. No idea Thomas was so old! Good article.